BC can be used against any zone, here it is against a 2-3. 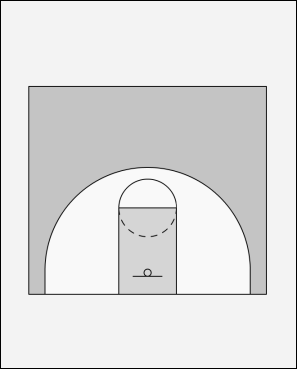 On the initial pass from 1 to 2, 5 screens the middle of the zone. 4 cuts to the short corner and 3 dives to the opposite block. 2 reverses the ball to 1, then runs the baseline. On the pass, 4 x-cuts out. 5 looks to screen the middle defender, 3 picks a gap with a x-cut off of 4. 5 continues to the opposite block. As 1 reverses the ball to 4, 3 slides down the lane to the block. 4 reverses the ball to 2 (2 can be from the wing to the corner). 5 screens the middle of the zone (and opens up to the ball), and 3 cuts to ball side short corner. 4 dives to replace 3 and 1 replaces 4. If 2 reverses to 1 the same movements and screening occurs as before. 4 x-cuts off of 3.